Application is possible when there is any desired flights appeared after your search. A. The online tentative reservation for 24 hours. The immediate online tentative reservation is available for 24 hours. After your tentative reservation is completed, automatic confirmation mail for your tentative reservation will be sent to you. B. Application by phone is available during our opening hours. Our operator will inform you of the availability of the flight and the ticket price on the phone.We can secure your seats on the phone after your confirmation of the flight detail.Please feel free to ask any questions about air tickets. Fill out the application form and click the button to confirm your application. This application through website is available for 24 hours. Please note that your seats will not be formally secured through online application.Our operator will check the availability of your desired flights based on your application form. Our operator will contact you by e-mail or phone to inform you of the availability and the cost of the air tickets. 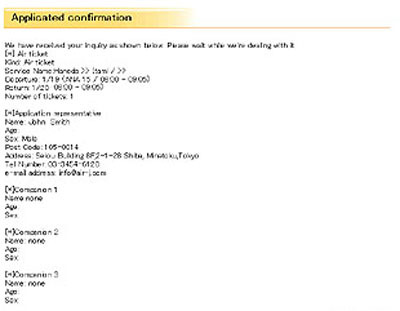 Your seats will be formally secured after you have confirmed the flight details. 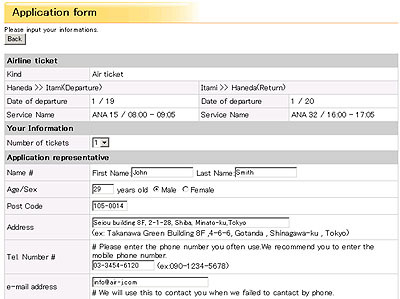 Your seats will be booked based on the information in your application form, so please input information properly. Please check your application form. After having confirmed there is no error in your application form, please click the application button to apply. Your application form sent to us will be displayed and automatic reply e-mail will be sent to your e-mail address with your application detail. 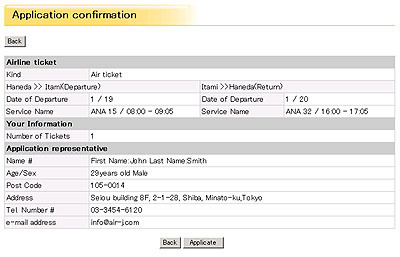 Our operator contact you by e-mail or phone to inform you of the availability and the cost of the air tickets.